many communities locally and internationally. providing care in isolated and underserved areas. SIEAM students gain exposure to the use of East Asian medicine in these settings in a variety of ways: through our curriculum and through engagement with faculty and alumni who are actively involved in these projects. As part of its curriculum, SIEAM students complete courses, such as, Acupuncture and Global Health, Acupuncture and Public Health, and the use of East Asian medicine in Traumatic Injury. These courses provide a basic introduction to the challenges that face practitioners working in these settings and they provide a basic overview of some of the options available to students and to practitioners. 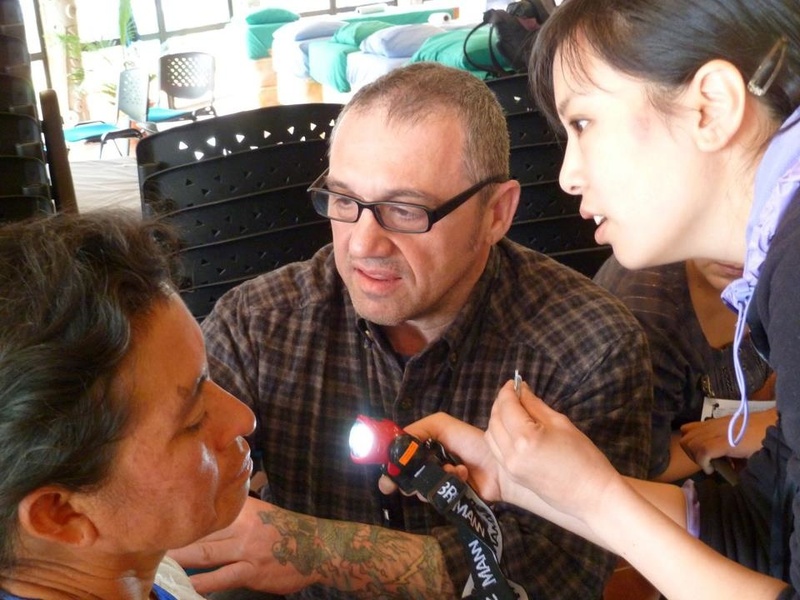 For example, Jen Resnick, who is featured below, teaches coursework on the use of acupuncture in relief organizations and in times of disaster. The goal of the course is to help inform students about existing organizations, and to provide specific clinical information from an eastern and western perspective on how to handle the unique health conditions that could be faced. There is hands-on instruction in emergency care techniques as part of the training. Several of SIEAM’s faculty volunteer a significant amount of their time with organizations providing care to underserved communities in the US and internationally. Furthermore, students in good academic standing at the Institute have opportunities to participate in volunteer medical missions with a SIEAM faculty at various locations such as Navajo Nation, Nepal or Guatemala, as their schedule and finances allow. SIEAM alumni have also been involved in these organizations, both as founding members and as participants. Daniel L. Altschuler, a core faculty member, is a Founder and the Executive Director of Open Hands Healing, an organization that brings East Asian medicine to communities in need. Daniel leads volunteers who are trained in traditional and modern field medicine to Nepal, South East Asia and any other underserved region. Yefim Gamgoneishvili, a faculty member, is part of the leadership team of The Integrative Health Project, an organization that collaborates with local biomedical providers to bring integrative care to communities in need in Latin America and the Caribbean. Yefim leads at least 2 trips per year to Guatemala. Jen Resnick, a faculty member, is a Co-Founder and the Director of Programs and Research Development of Global Alternative Healthcare Project (GAHP). Over the past 10 years, Jen has organized and served as a senior clinician on aid trips in the US and globally, including a 2017 GAHP trip to Standing Rock to work with other related organizations to provide care and support to the indigenous resistance to the Dakota Access Pipeline. Grainne McKeown, SIEAM graduate Class of 2008, is the founder of Mindful Medicine Worldwide. Mindful Medicine Worldwide is a non-profit organization, bringing long-term integrative health care to people of developing areas, by establishing and operating free integrative health care clinics. Professional volunteers, Acupuncturists, Chinese Doctors and other alternative care practitioners, provide medical services and healthcare education. Mindful Medicine Worldwide is rooted in a practice of mindfulness, education, research and training. Katherine Taromina, SIEAM Academic Dean, and Craig Mitchell, SIEAM President, were among the core group of volunteers who organized relief efforts to provide care to the search and rescue teams of FEMA in the aftermath of 9/11. Katherine became the first President of the Professional Acupuncturist Response Team (PART), an organization that developed guidelines to help inform how similar efforts could be approached in the future. She now serves as a Site Team Leader for the Global Alternative Healthcare Project (GAHP) with a focus on leading trips to Navajo Nation. Finally, in order to “advance complementary and alternative (CAM) practitioner clinical education in the areas of public health and community wellness within the US and international communities”, the leadership of SIEAM founded the Center for Integrated Care (CIC) in 2010. Part of the Center’s purpose is to serve as a resource for practitioners and organizations in order to raise visibility and increase support for their work by maintaining a directory of organizations on its website.